If you’re like me, sooner or later in your crocheting life you’re ready for more than the same free patterns that everyone else has already crocheted. You want exciting, exclusive, designer crochet patterns to set your work apart from everyone else’s. You want carefully edited crochet designs that allow you to achieve professional results. You want new techniques explained to you in professional videos so you can learn them quickly and easily. And you want it all from someone you trust to get it right. Now that dream has become a reality. AllFreeCrochet, the leading free crochet website and home of the most talented designers in the crochet community, brings you I Like Crochet, a premium digital magazine that delivers all this and more—from crochet stitches, patterns and video tutorials to new products to gorgeous, professional photographs of every single project. YES! I want the ultimate crochet resource, including custom designer crochet patterns, professional photography and video, and expert tips and techniques! Oh—and it’s all advertising-free, just as our customers have requested. Our designers deliver crochet scarf patterns, crochet shawl patterns, crochet sweater patterns, crochet doily patterns and even granny square patterns that you simply can’t get anywhere else. That’s right: Only subscribers to I Like Crochet will have access to these exciting crochet designs. Our experienced crochet editors have handpicked these designers and patterns, based on their vast knowledge of what the crochet community demands. They’ve tech-edited every pattern to ensure flawless projects. They deliver gorgeous, professional, full-color photographs of finished projects. They teach you the latest tips and techniques in video format, delivering hundreds and hundreds of dollars’ worth of instructional videos. You get all of this every other month, six times a year — crochet stitches, patterns, tips, techniques and product picks—in a state-of-the-art digital magazine that you can take with you wherever you want to crochet! Take it to the beach, read it on the train, enjoy it at a crochet party with friends—it’s yours to enjoy anywhere! Subscribing to I Like Crochet will cost you less per month than you’d spend on just one cup of coffee—a tiny investment in the enormous enjoyment you get from crochet. Perhaps you want to learn how to crochet a scarf. First, I Like Crochet delivers the most exclusive completely custom crochet scarf patterns that you can’t buy anywhere on the Internet or in stores. Of course, every pattern has been carefully checked by our editors so you avoid frustration and time-consuming mistakes. We know every crochet stitch counts, because we’re all crochet lovers ourselves! Next, you’ll see in our professional photographs exactly how the finished piece is supposed to look. What’s more, many projects in I Like Crochet are explained to you step by step in professionally-produced, easy-to-follow videos! And you get all this whether you’re looking for crochet scarf patterns, crochet shawl patterns, crochet sweater patterns, crochet doily patterns or any other of the popular items you can crochet—every time, in every issue. Best of all, you’ll get every one of I Like Crochet’s crochet designs FIRST—before anyone else even has a glimpse! You’ve just added all of this to a personal collection that lives on your tablet or computer! For me, this just might be the most exciting thing about I Like Crochet. I moved not too long ago, and while I was emptying out my attic, I came across a box full of dusty crochet pattern magazines I had collected…and then, because they’re so bulky to store and access, I’d forgotten about them. Not only did they do me no good living in the attic, but now I had to lug that heavy box to my new home! I can’t wait to start building my new collection of exclusive crochet doily patterns, crochet dishcloth patterns, crochet scarf patterns, crochet sweater patterns, crochet stitches, videos and gorgeous crochet photos—all on my tablet, and all accessible to me anytime I want them! I can even resize the patterns to make everything I crochet personalized for me and my family and friends. I Like Crochet is truly the answer to a crochet lover’s dreams! Normally, custom crochet designs from top designers are only available to crochet experts. Everyone else is limited to free or inexpensive patterns—simple granny square patterns, crochet shawl patterns, crochet doily patterns, crochet scarf patterns and the like. They’re fun to make, but aren’t always very exciting. I Like Crochet has changed all that. We carefully choose the designers who are in demand, hire them to create patterns exclusively for our readers and make sure every stitch and every step is documented so that even crochet novices can successfully create these projects. Imagine the satisfaction you’ll get when you complete your first I Like Crochet professional-looking project! You simply can’t get that kind of enjoyment, or such beautiful results, with less-than-premium patterns and crochet designs. Perhaps you’re in the mood for a crochet sweater pattern. You could search the Internet for “free crochet sweater patterns” and find quite a few. But what do you know about the designer? Has the pattern been triple checked like every pattern at I Like Crochet? Professionally photographed? Did the designer pass our exacting screening process? And the design may…or may not…be something you really want to wear. Just because it suits the taste of one crochet lover doesn’t mean it’s truly fashionable, flattering or suitable. But no one has the deep understanding of what crochet lovers like you really want—or the data to prove it—like the team at I Like Crochet! Our years of meeting the demands of thousands and thousands of crochet lovers tells us exactly what you want and expect in crochet patterns. We add the expertise and fashion sense of the crochet community’s top designers to the mix, too, so you’ll always love the pieces you create—and the high-end look you get when you wear them. Of course, with most free crochet patterns you never know how well they’re going to work out. There could be a step overlooked, or the wrong number of crochet stitches or any number of mistakes. That means you have to unravel everything you’ve done, figure out the problem yourself and start over. What a waste of time and effort! No, if you want truly beautiful, professional results, you want I Like Crochet. Our Mint Breeze Cardigan, for instance, is a stylish, polished look that anyone can crochet. And we’re always in good taste, as you’ll see if you crochet our Downton Cardigan, offering vintage elegance and sophistication for a modern world. Why settle for less when you can have expert, foolproof instructions, professional photos and videos and fashionable, custom crochet designs created just for you as an I Like Crochet reader? Naturally, I Like Crochet is about more than just fashion because we know you are, too. Every issue includes things like crochet doily patterns, crochet dishcloth patterns, booties, baby blankets, curtains and pillow designs. How about Mommy and Me Beanies? Tunisian Lace Curtains? Or perhaps a Mary Had a Little (Amigurumi) Lamb? These are just some of the dozens of exclusive designer crochet patterns that I Like Crochet readers will enjoy in every issue—and all year long. But of course, this stunning digital magazine has a lot more to it than just crochet patterns. Remember, you also get tips, tricks and instructional videos and even links to additional references in each issue to ensure that you master every crochet stitch and technique in every project. I know you’ll also enjoy the product reviews, book recommendations and even crochet hook size advice. We want to eliminate the guesswork so all you have to do is enjoy the crochet experience! I certainly hope you’ll up your crochet game with us and subscribe to I Like Crochet right now! It’s such a small price to pay for so much enjoyment, and there’s simply no comparison between its consumer friendly professional crochet designs and digital enhancements, and the free patterns you can find on the Internet. Of course, your subscription to I Like Crochet is absolutely risk-free and guaranteed: If at any time you change your mind about it, you only have to tell us, and we’ll refund the entire cost of all unserved issues—absolutely no questions asked. Not that I expect you to change your mind…because I Like Crochet is so popular with your fellow crochet lovers, if we had to print it on paper, we might completely sell out each issue! I look forward to delivering to you our unique, professional designs, crochet patterns, advice, photos and instructional videos that you simply can’t get anywhere else! PS: Did I mention that every issue contains 25 to 30 exclusive crochet designs? Unless you crochet night and day, you may never have time for everyday, mass-market crochet patterns again! PPS: Remember, professional patterns lead to professional results. 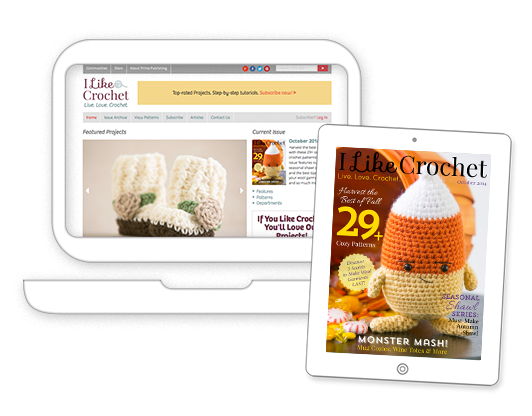 You’ll never be disappointed or frustrated with a project again—we guarantee it—when you subscribe to I Like Crochet!